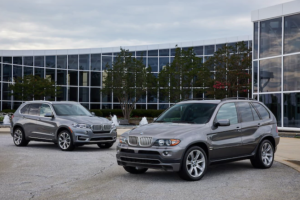 First X3 rolls off line as BMW celebrates 25 years as U.S. manufacturer. 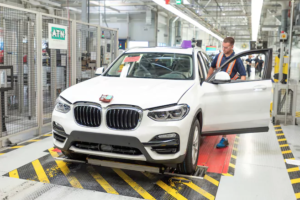 BMW announced today a further $600 million investment in its manufacturing plant in Spartanburg, South Carolina, adding another 1,000 jobs by 2021 to the 9,000 already employed to assemble the X3, X4, X5, X6, and X7 crossovers, including electric and M performance versions. 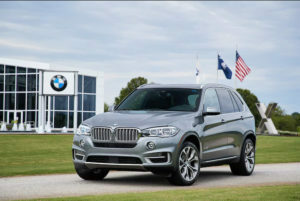 The investment was announced at the world premiere of the third-generation BMW X3, which goes into production here in July. And the news comes as BMW celebrates 25 years since the decision to manufacture in the U.S. Spartanburg is the automaker’s largest plant by volume in the world, with the capacity to make 450,000 vehicles a year and more than 1,400 a day. By 2021, BMW will have invested $8 billion in the manufacturing complex that opened in 1994, and the workforce will exceed 10,000 employees. BMW has spent $1 billion on a new body shop that will make everything from the new X3 to the all-new X7 in 2018. 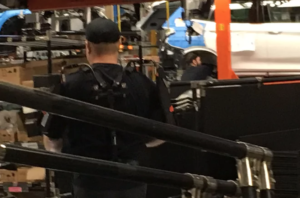 The plant’s two existing body shops will have their equipment removed and the space used for logistics to keep the massive operation running smoothly. Spartanburg was the only global source for the X3 in its first two generations, but increased demand led to the decision to add more production in Rosslyn, South Africa and Shenyang, China. The additional plants will go into production about nine months after the U.S. plant starts building the X3. 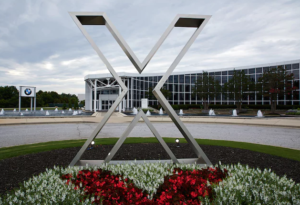 Having additional production frees up some space for Spartanburg to add the new X7 next year. The first new X3 rolled off the line in Spartanburg today and will be on sale this fall. The automaker has delivered more than 1.5 million small crossovers worldwide since its launch in 2003. BMW Group is the largest vehicle exporter from the U.S. in terms of monetary value. In 2016, 287,700 BMW vehicles with a total value of more than $10 billion were exported from Spartanburg: 86 percent were shipped from the Port of Charleston, with the remaining 14 percent dispatched from five other ports in the Southeastern U.S.
A tour of the Spartanburg plant showed some new initiatives to improve the work life of employees beyond the growing number of robots who do precision work and heavy lifting that are hard on the body. After hearing a TED talk on the use of exoskeletal devices to help reduce muscle strain and fatigue, manufacturing engineer and assembly planner Frank Pachiro started exploring devices to help workers build cars. He worked with suppliers to design exoskeletons for auto workers. After a lot of trials, Pachiro placed an order for the first 24 last year from supplier Levitate. Today, there are 37 in use across the plant and that will grow to 66 by the end of July. Ideally, he would like to offer them to everyone. The exoskeletons are strapped on. They have springs and cables in “cassettes” attached to each upper arm giving the worker more boost which means 30-40 percent less work for the muscle, reduced strain on the arms, shoulders, and back, and ultimately less fatigue at the end of a 10-hour shift. He is also looking into exoskeletons to aid the lower back and legs. “We are the first plant and the first automaker to use it,” Pachiro said. Other BMW plants, including the one in Munich, are getting ready to try exoskeletons, as well. And Pachiro has also shared his work with competitors such as Honda, Toyota, and Nissan and says they are looking at using the devices. Pachiro is also using 3D scanning of the entire plant to better plan any future changes, retooling, or expansions. Looking at the maps with 3D glasses allows BMW and its 265 suppliers to see a clearer picture of the space to decide if a robot would fit, for example, or optimize a work station. It makes it possible to get new equipment on site faster.